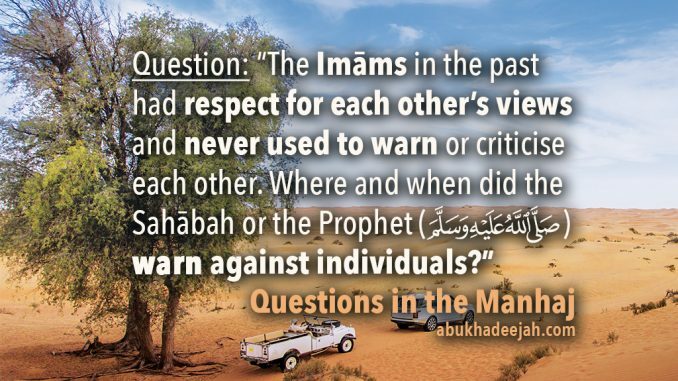 The question states that the Imāms of the Salaf never warned against each other, that the Imāms of the Salaf never criticized each other. And the questioner asks, where is the proof that the Prophet (sallallāhu ‘alayhi wa sallam) ever warned against anyone? Likewise, there is a hadīth of the Prophet (sallallāhu ‘alayhi wa sallam) wherein he stated that there will appear in this Ummah a people who will deny the Pre-Decree, i.e. the Qadariyyah. He commanded that if they fall sick, do not visit them, and if they die, do not pray Janāzah for them. In a narration, the Prophet (sallallāhu ‘alayhi wa sallam) said about the same sect, the Qadariyyah, that they are the Magians of this Ummah. Is this not the Prophet (sallallāhu ‘alayhi wa sallam) warning against the innovators in these narrations? The Prophet (sallallāhu ‘alayhi wa sallam) said that every innovation is misguidance, and every misguidance is in the Hell-Fire. Is this not a severe warning? The Prophet (sallallāhu ‘alayhi wa sallam) would address the Sahābah, every Jumu’ah and say to them, “The worst of all affairs are the newly invented matters. And every newly invented matter is an innovation, and every innovation is a misguidance, and every misguidance is in the Hell-Fire.” He was warning them from innovations in Religion, and none of the Sahābah were upon Bid’ah, yet he was warning them because they wanted them to know that Bid’ah will come and how to behave towards it. So there arose in the time of the Sahābah the four well-known sects of innovations from the 72 deviated sects: The Khawārij, the Qadariyyah, the Shī’ah and the Murji’ah. Also, the narration of ‘Abdullāh ibn ‘Umar (radiyallāhu ‘anhumā) in the first hadith of Sahīh Muslim when Yahya bin Ya’mar came to him and informed him of the affairs in Iraq. He stated that he first person to speak about Qadr in Basrah in a deviated manner, upon Bid’ah, was Ma’bad al-Juhani. He Informed Ibn ‘Umar that these people have knowledge but they deny the Pre-Decree. ‘Abdullāh ibn ‘Umar (radiyallāhu ‘anhumā) said to him: “Inform them that ‘Abdullāh ibn ‘Umar is free from them, and they are free from him.” In this statement is a warning and abandonment of Ahlul-Bid’ah. Imām at-Tabari and others have mentioned that those who will be turned away from the Lake of the Prophet (sallallāhu ‘alayhi wa sallam) on Yawm al-Qiyāmah are the Khawārij, the Qadariyyah, the Murji’ah, etc. They are Ahlul-Bid’ah in general. Is this not a severe warning from the Prophet (sallallāhu ‘alayhi wa sallam)? There occurs in a hadīth of the Prophet (sallallāhu ‘alayhi wa sallam) that is authenticated by Shaykh al-Albāni (rahimahullāh) in his As-Silsilatus-Sahīhah where the Prophet (sallallāhu ‘alayhi wa sallam) said that there will be two groups of his Ummah that will be prevented from his Drinking Lake (the Hawd) on Yawm al-Qiyāmah: the Murji’ah (those who believe that actions are not from Īmān) and the Qadariyyah (those who deny the Pre-Decree). There was a man known as Dhul-Khuwaysarah at-Tamīmī who stood up in front of the Prophet (sallallāhu ‘alayhi wa sallam) after the Prophet had distributed some wealth among the people. He said to him: “Be just, O Muhammad!” Then he said: “Fear Allāh, O Muhammad.” The Prophet (sallallāhu ‘alayhi wa sallam) said: “From the offspring of this man will come a people, they will recite the Qur’ān and it will not go beyond their collarbone.” Meaning, they will recite it on their tongues and it will not enter their hearts, it will not strengthen their Imān or understanding. Was the Prophet (sallallāhu ‘alayhi wa sallam) not warning against such people who stand and oppose the Muslim ruler and accuse the Sunnah? He (sallallāhu ‘alayhi wa sallam) also said: “There will arise from my Ummah a people who would recite the Qur’an, and your recital would seem insignificant as compared to their recital, your prayer nothing as compared to their prayer, and your fast nothing when compared to their fast. They will recite the Qur’an thinking that it supports them, whereas it is an evidence against them. Their prayer (salāh) will not get beyond their collarbones and they will shoot through Islam just as the arrow passes through the prey.” The Prophet said about them: “The Khawārij are the dogs of the Hellfire.” (Ibn Mājah, 173 from Ibn Abee Awfaa). As for the scholars not warning against each other, then Ahlus-Sunnah have no need and no reason to warn against each other. Why would they warn against each other? Yes, criticism does take place between them when they see errors. So, when a scholar refutes another scholar, it can occur in matters open to ijtihad, but not in matters of ‘Aqīdah because Ahlus-Sunnah have one ‘Aqīdah, one belief, one methodology. And their refutations do not lead to warning from each other or boycotting each other. For example, Shaykh al-Albānī responded to Shaykh Ibn ‘Uthaymīn and Shaykh Ibn ‘Uthaymīn responded to Shaykh al-Albānī. Shaykh Ibn Bāz responded to something that Shaykh Ibn ‘Uthaymīn had said. And this happened between the scholars but their ‘Aqīdah was one. Their corrections and responses upon each other are in matters of ijtihād and matters of the branches of the religion wherein certain rulings are open to different understandings. But in their ‘Aqīdah, in their Manhaj, and in their Usool, Ahlus-Sunnah are one. And likewise, why would Imām Mālik warn against Imām ash-Shāfi’ī? Why would Imām Ahmad warn against Fudhayl ibn ‘Iyād? Why would Imām Bukhārī warn against Imām Muslim? There’s no need to warn against each other because their ‘Aqīdah and their methodology were one. They were not Murji’ah, they were not Khawārij, they were not Jahmiyyah, and they were not Ash’ariyyah – in short, they were not innovators. So, why would they warn against each other? There is no need for Ahlus-Sunnah to warn against each other. But those who fell into Bid’ah, and persisted upon that, then yes, Ahlus-Sunnah (the Salaf) would warn against them. That’s why Imām Ahmad warned against al-Karabīsī. Al-Karabīsī was a man of Sunnah. Then he took on the ideas of the Jahmiyyah and Imām Ahmad warned against him. And after that, he no longer was taken as a scholar. When Imām Abu Hanīfah (rahimahullāh) erred in the issue of Īmān when he said that Īmān doesn’t increase or decrease and that actions are not from Īmān, this is the doctrine of the Murji’atul-Fuqahā. Was he warned against? Yes, by a body of scholars. Some of the later scholars stated that he erred out of a mistake and due to those around him, and we are required to have good suspicions for him because, they stated, that if the truth had been made clear to him, he would have corrected himself (rahimahullāh) and Allah knows best. But as for the one who persists in his error then you will find the scholars throughout the ages warning against him and his Bid’ah. And this is why these narrations are there. That’s why ‘Abdullāh ibn ‘Umar (radiyallāhu ‘anhumā) warned against Ma’bad al-Juhani and his followers in Basrah. That’s why ‘Ali (radhiyallāhu ‘anhu) and the rest of the Sahābah warned against the Khawārij. And that’s why ‘Ali (radhiyallāhu ‘anhu) warned against the Shī’ah and punished them as is recorded by Al-Bukhāri in his Sahīh. And that’s why Anas ibn Mālik, the companion (radhiyallāhu ‘anhu) forbade the people from praying behind the Murji’ah. So, all of this is established, bārakallāhu fīkum. Yes, the great scholars of our time of Ahlus-Sunnah (the Salafi ‘ulamā), like Shaykh Ibn Bāz and Shaykh Ibn ‘Uthaymīn, and the scholars from the previous times differed in matters of the branches of the religion wherein there can be more than one understanding of the Texts. An example of that is when Shaykh al-Albānī differed with Shaykh Ibn ‘Utaymīn and Shaykh at-Tuwayjri concerning the niqāb. And they opposed each other over the issue of whether the niqāb, the face veil for the woman, is obligatory or not obligatory. But that is from the matters of ijtihād where you can see that their various understandings of the texts. However, in the Usool, in the foundations, in the Tawhīd and ‘Aqīdah they were united. This unity between Ahlus-Sunnah does not include Ahlul-Bid’ah such as Jamā’at at-Tablīgh, the Shī’ah,the Khawārij, al-Ikhwān al-Muslimīn, the Mu’tazilah, Jamā’at al-Jihād or the various sects of Sūfiyyah such as the Naqshbandiyyah or the Brelawiyyah and so on. That is because Ahlus-Sunnah differ with these group in the Usūl, the Manhaj and ‘Aqīdah. When there is a difference in these fundamentals, then there’s no room to manoeuvre or to accept various types of belief that oppose the Qur’an, Sunnah and Ijmā’. This is different from certain affairs in Fiqh that are open to ijtihad (juristic opinion). This differing means that there’s a variant understanding based upon the texts, so a scholar understands it one way and another understands it a different way. This difference should not lead to partisanship (hizbiyyah) and fanaticism (ta’assub) and blind following (taqlīd) of a particular shaykh and warning against others. So, this type differing cannot be in the ‘Aqīdah and the foundations of the Religion because the Sahābah never differed therein as Ibn Taymiyyah (rahimahullāh) mentioned in his work, Minhāj as-Sunnah. This was also the case with the Tābi’īn, and the Atbā’ut-Tābi’īn, and the early scholars of hadīth; they never differed in ‘Aqīdah and the Usūl. Any differing that occurred between them was in matters open to ijtihād from the branches of the religion. And, if per-chance someone differed in a point of ‘Aqīdah (or Usūl) then he was corrected and he was harshly refuted if he did not rectify his affair, and repent and return to the truth – as in the case of Imām Ahmad against al-Karabīsī and al-Muhāsabī and Ya’qūb ibn Shaybah. All of these were Scholars of Sunnah. Imām Ahmad and others from the scholars refuted them when they deviated in ‘Aqīdah and adopted the ideas of those who denied and distorted the Attributes of Allāh, from among the Jahmiyyah and Mu’tazilah.